Teens often look at a driver’s license as a rite of passage to adulthood. The fact is inexperience is a leading factor in traffic accidents involving new drivers. This is the reason parents seeking auto insurance for youthful drivers often go into shock at the auto premium costs. First, know the Florida Laws that affect you and your teen driver. Second, it is important to help teens understand driving well before they embark on the exciting journey ahead of them. Teen drivers get safe driving examples from many places: television ads, driving instructors, their friends. But no one has more influence over their future driving than their parents. The best teacher of a new driver is a good role model. Well before your teen starts driving you should be demonstrating with your own behaviors by following all rules of the road. Back to the Basics – Stop signs mean to come to a complete stop. Rolling stops are not stops. If you’re a teacher Fords – Diving Skills for Life – Educator Materials can help you teach this program in your classroom. Face it your teens are influenced by the driving examples of their parents. Before they start their driving journey you need to be keenly aware of the driving habits examples you display. Teach them the same caution and skills you want from them when they are behind the wheel. 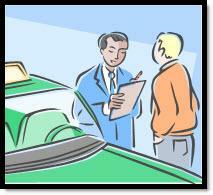 Auto Insurance Florida Teens - If you’re the proud parent of a youthful driver we can help! Call us or request a free online quote today.